I get embarrassed sometimes when I have speak to strangers(or people in general). I admit a majority of it in the past was due to my shyness; as a child I was the one who would hold on to my parents leg and bury my face into their leg whenever I had the chance. Thankfully growing up has provided me with enough confidence to at least not run away and hide when I have to meet new people. However my problem now is not my shyness but my pronunciation of the English language. Yep the old tomato debate; and everything that comes along with it (e.g. spelling/grammar). I have the worse time when it comes to pronouncing words for the first time. This is particular embarrassing when I have to go shopping. You might ask why shopping would cause me problems rather than a normal conversation. Over the years I have developed my skills in the kitchen and my knowledge about cuisines; this means I can bake and cook more variety for my family and friends. This has directly affected the amount and range of ingredients I buy so I can taste them and cook with them. I do not know about you but why, why are some food stuffs so hard to pronounce? Especially referring to the European countries cheese and deli products. I think it took me a couple of goes at German food stuffs to get it remotely right. I might be a baker of sweet things but I am a savoury girl at heart. I do not think there is anything better than cheese, butter and bread. So every time I go shopping I am always after a new cheese. My most recent trip to the supermarket illustrates my point exactly. I often buy my cheese from a deli section or a specialised deli, so I have to talk to someone if I want to buy dairy foods. This time I wanted to buy some an alpine cheese, sweet and nutty is what I was in mood for. Looking at the selection table, something caught my eye; a new cheese? Yes please! Unfortunately it also came with a complicated name, Berner Alpkäse. Let me say the person serving me was very nice to not make fun of me. I was surprised they were not more offended at the way I butchered the Swiss language, but I guess they are nice people. Maybe one day I will actually get one right first go, until then I stubble my way through language like most do. Thankfully mascarpone is easier to say and I have used it in a tart here today! After a few successful bakes, I have been using my tart tin more these days. I made these in honour of mother’s day a few days ago because I who can resist a tart? Mascarpone is a nice twist to the traditional white chocolate mousse. 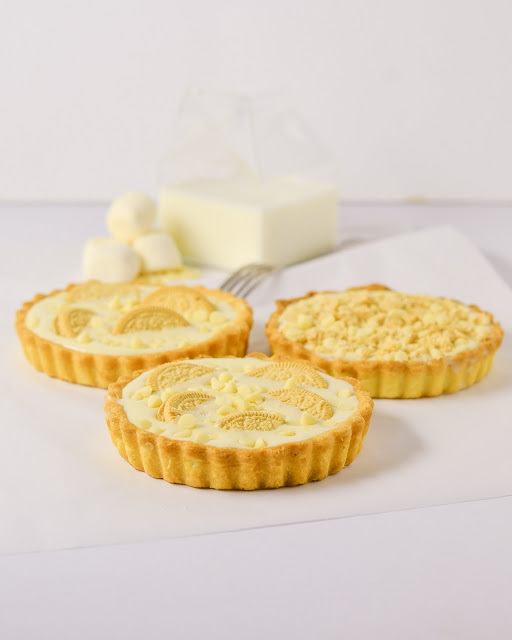 The rich cream texture of the cheese give more body to the mousse meaning it does not just disappear as you bite into it. Also the filling works as the tart shell is very short pastry made from half vegetable shorting and butter. 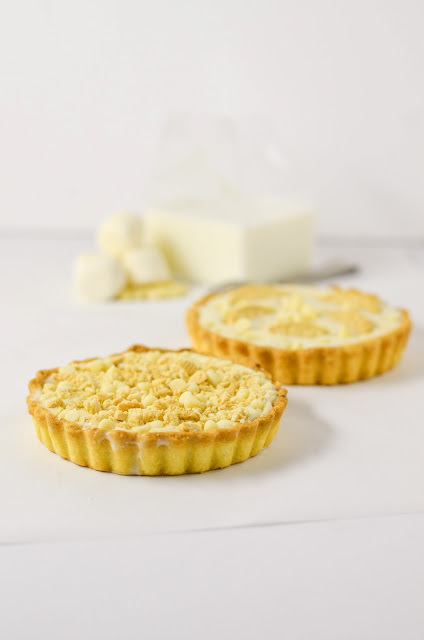 The contrast of soft and crispy is what makes this tart so special. Also I have been dying to try this design by Sandeea because I fell in love with it the moment I laid eyes on it. I did a crushed crumble oreo one as well. 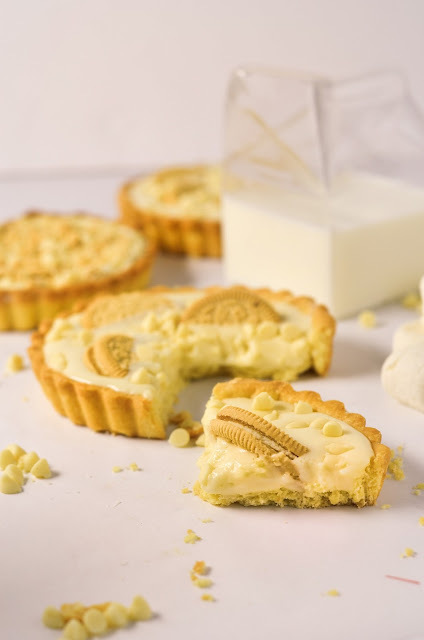 To make this one, crumble bits of oreo and white choc chips on top of the tart.What can I say I am sucker for golden Oreos. 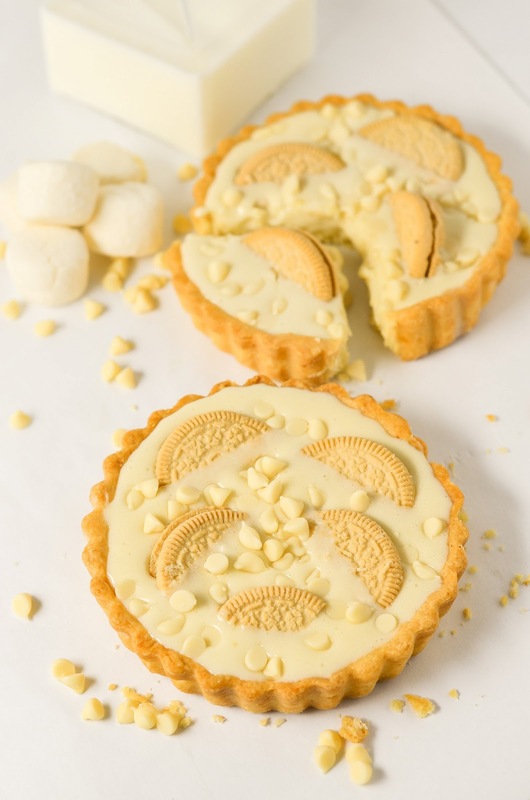 For those of who love white chocolate this is the one for you. 230g mascarpone cheese, room temp. In a food processor blitz all the ingredient but the ice water until it looks like yellow bread crumbs. With the motor running, Slowly add tsp. at a time until till becomes lumpy. Turn dough ball out on to a flour surface. Pat it into a circle shape and wrap with cling film. Roll your dough ball out on a floured surface to about 4mm thick. Line your tartlets cases (4 in this case) by rolling he pastry back on the rolling pin then draping it over the tart shell. Gently push the pastry in to the tart shell shape. Prick with a fork all over and fridge for 30minutes. Cover tart shell with cringle baking paper and fill with weights (bean, baking beads or coins). Bling bake for 10 minutes. 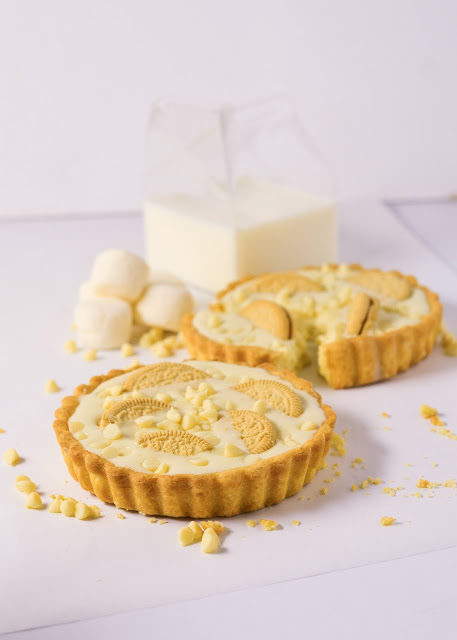 Remove baking beads and bake the tart shell for a further 10 minutes or until light golden. Allow tarts to cool in shells. Once cool, using a tea spoon, spread and coat the inside of these shells with white chocolate. Set aside till dry and ready. In another bowl mix your cheese, liquor, and icing sugar until combined. Add the white chocolate to this mix. Fold in. Whip your cream to soft peaks then pour into the white chocolate mix Fold till combined. Set aside until needed. 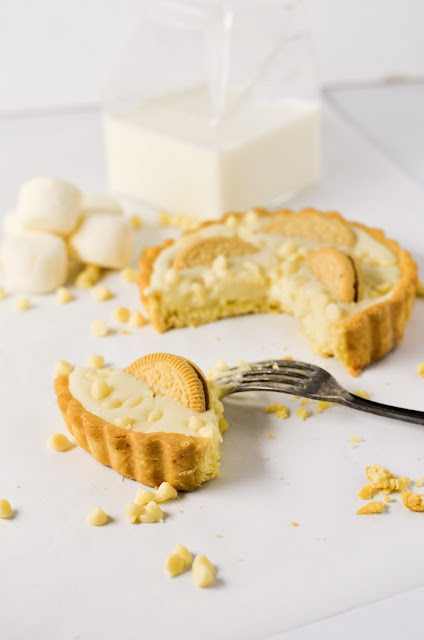 Half your oreo cookies and stick them into the tart. Finish with mini white choc chips, Refrigerate overnight. I have exactly the same problem haha. and we have so many european cheeses here in England. I just point and go , um, that one please! This looks delicious! White chocolate liquor? Where can i get this magic magic liquid? Pinned it onto my ‘freaking wow’ board. Hey Missy! Hahaha the point and go method , I like it. It is under the name of creme de cacao blanc, any good liquor store should have it. You can also use coconut rum if you have trouble finding it. I speak spanish as a first language, but know my english pretty well, and I read mostly in english. Since I never say new words aloud while reading, sometimes it´s years before I hear someone actually pronounce it and realizing I had it all wrong! These are scrumptious tarts! I would love to learn a new language, I think that is where my problem lies. I can only speak English, so all the accents and stresses are new to me. Wow!It is so interesting you speak Spanish. Come and teach me some time over cake? 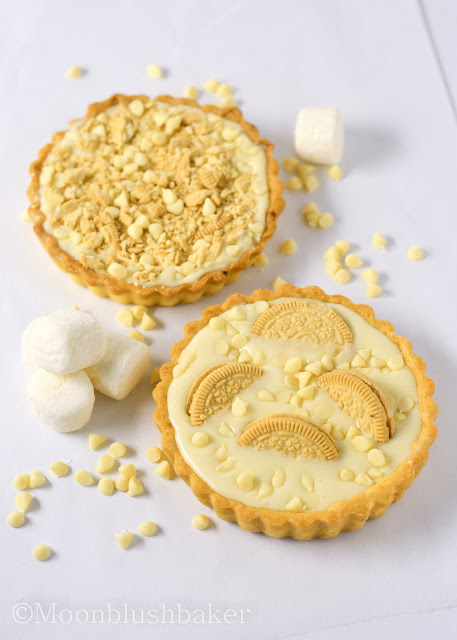 beautiful little tarts, i wish we had golden oreos here in the UK! cannot wait for more posts from you ! Thank you Em, they have only recently reach Australia. Maybe one day they come to you too! I am SO with you on shopping for cheese, butter, and bread. It’s one of my greatest joys in life! 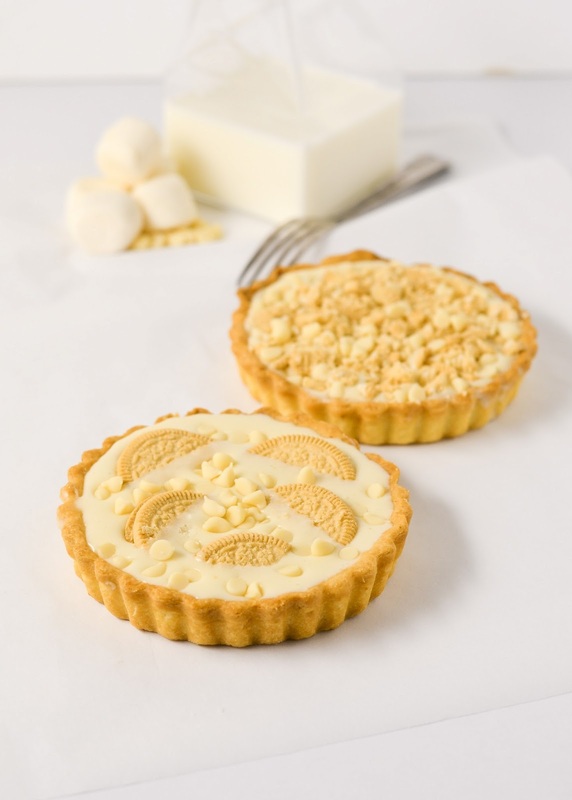 These tarts are so lovely! Quick German pronunciation guide: W == V, V == F, “ei” is the long I sound, “ie” is the long e, “ch” varies from “sh” in the south (Bavaria) to “k” in the North. No silent letters (final e is an “eh” sound) or (pf is p-f, two similar plosives in a row). And anything with an umlaut (the two dots over a vowel, or a vowel followed by “e” is a sort of short vowel sound with a bit of an “h” or an “r” — boese comes out like “berse” for example. Hey Ken, Thanks for the tips! I get awfully embarrassed at the deli counter because of it. Same to you. I am chinese but most chinese people are pretty laid back when it comes to language. As long as it sounds correct, anything goes. Thank you Nami. I found these very hard to photograph because I did it at night! these are so cute. they sound delish too!